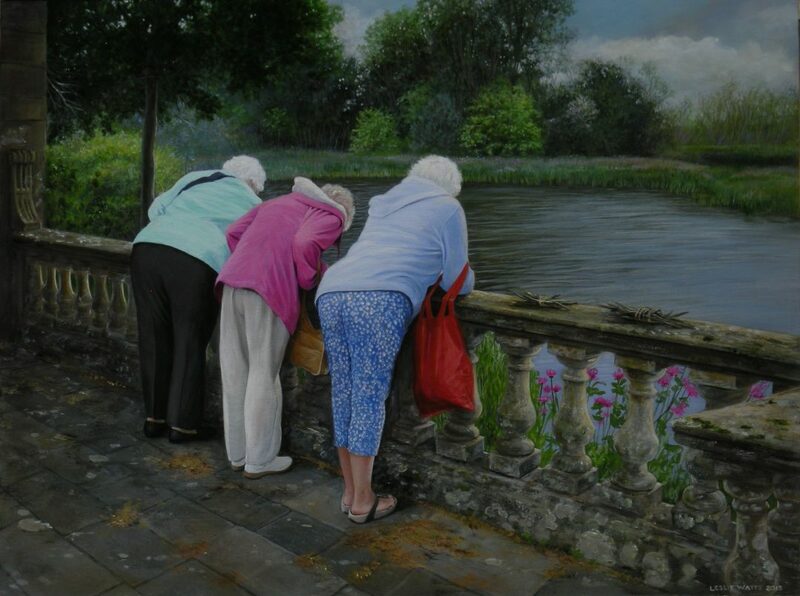 Leslie Watts is the painter behind ‘Dora Steps Out’, a very close runner up in this year’s Jackson’s open Painting Prize. Dora happily strolls with her son down a regular street in Oxford but – wait a sec – Dora is also teetering dangerously on the edge of a tall building, dicing with death, giving herself a little thrill. Which is the real Dora? The painting is highly detailed and very sensitively painted, and the seemingly conventional street scene makes the appearance of Dora twice in the painting all the more surreal. 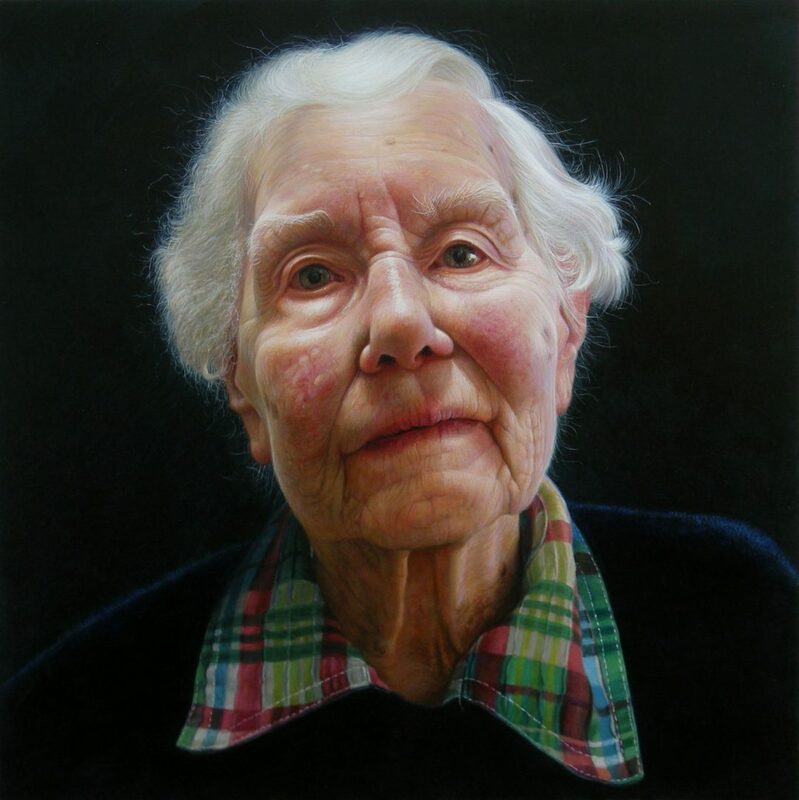 Leslie Watts is a highly reputable portrait painter who has exhibited at the BP Portrait Award 3 years’ running; she also loves to paint animals in unlikely environments and exquisite still lifes. In this interview she explains that painting in a highly realistic manner requires creative interpretation and is not about ‘just copying photos’, and how social media helps her keep in touch with other artists all around the world. Lisa: Can you tell us about ‘Dora Steps Out’? What inspired you to paint this picture? 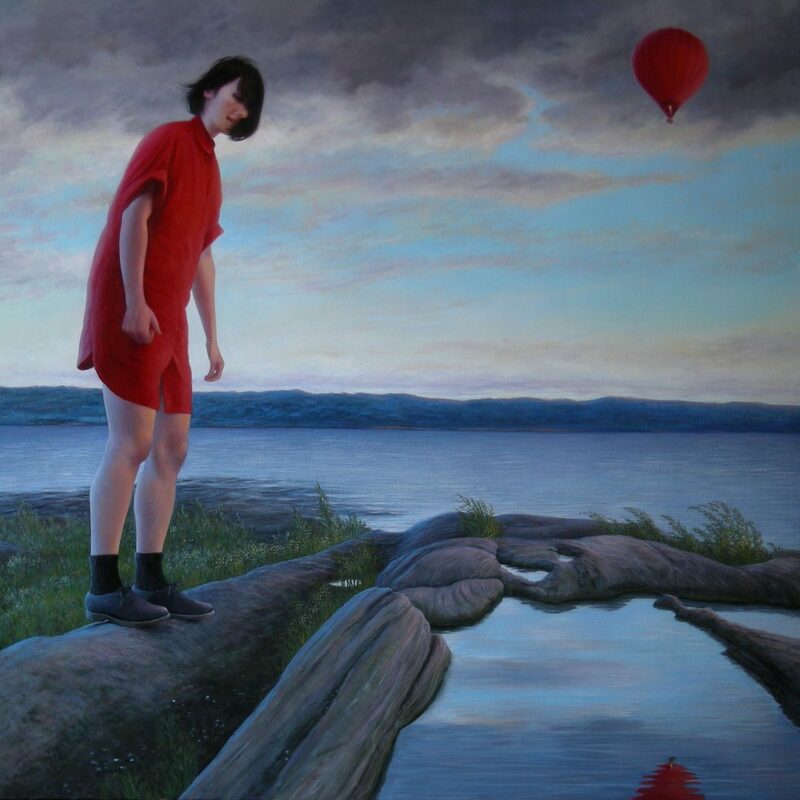 Leslie: A couple of years ago, the then director of Gallery Stratford, the public art gallery in the city where I live, decided to give our annual juried exhibition a theme: Pushed to the Edge. Having given up picture book illustration mainly because I no longer wanted anyone telling me what to paint, at first I felt a little put out. But as I went through my folders of reference photos, looking for something that might work, I came to realize that this sort of challenge actually appeals to me. It was like a puzzle that needed solving. I’d been to Oxford while on holidays in the UK, and I’d taken several pictures from the top of the Carfax Tower. As I zoomed in on the particular photo I ended up using, I saw a woman in a red coat walking with a man I presumed to be her son. My original intention had been to paint her on the roof and delete her (along with all the other passers by) from the street. But once I’d edited her onto the roof in the photo, I realized that the painting would be a lot more interesting if I also left her in her original position. I chose the title because it has a few different meanings. I don’t know whether she’s actually on the roof looking down at herself or whether she’s on the street imagining herself in a different place. It’s a fantasy about growing old. I was lucky that the real “Dora” happened to be walking by when I took the photo. I can’t imagine coming up with this idea without seeing the image first. Lisa: What do you find so compelling about painting realist portraits? Leslie: I love the challenge of making a painting that looks like a person looking back at me. I used to wish that I could paint a little more loosely, and be less tied to what I think is a quite literal interpretation of my subject, but I can’t seem to do it. Usually I just keep painting until the portrait looks the way I want it to look, but I never know ahead of time how long that will take. And I certainly don’t know before I start exactly what I’m trying to do. I just know when I get to that point. And that point happens to be when the painting looks realistic. 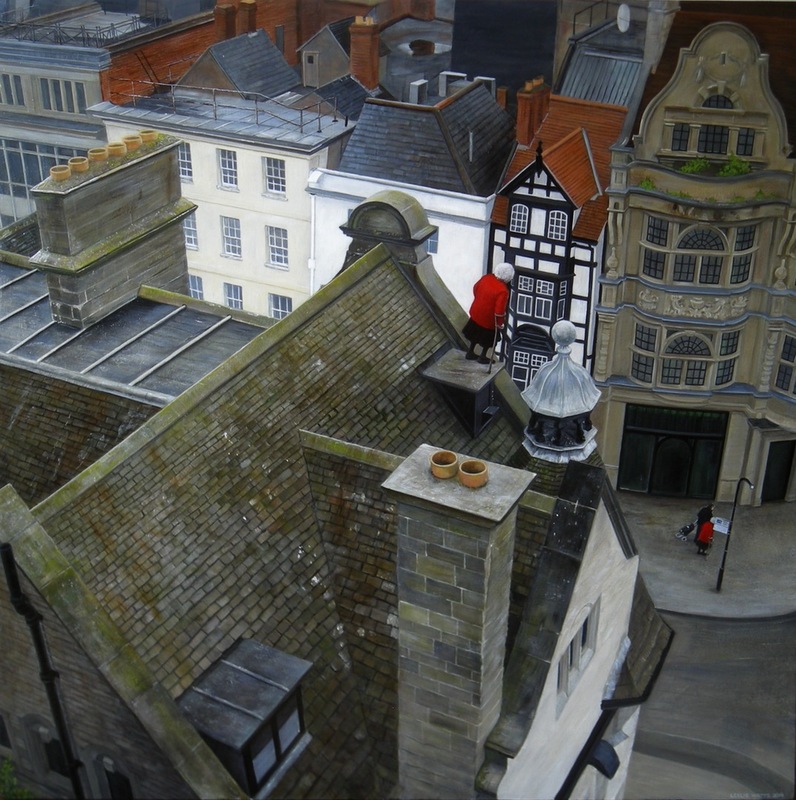 Lisa: Your work is highly detailed and some would say hyper-real, but every now and then you throw in a curveball, as in ‘Dora Steps Out’ when you place the figure teetering dangerously close to the edge of a building as well as happily strolling down the pavement below. 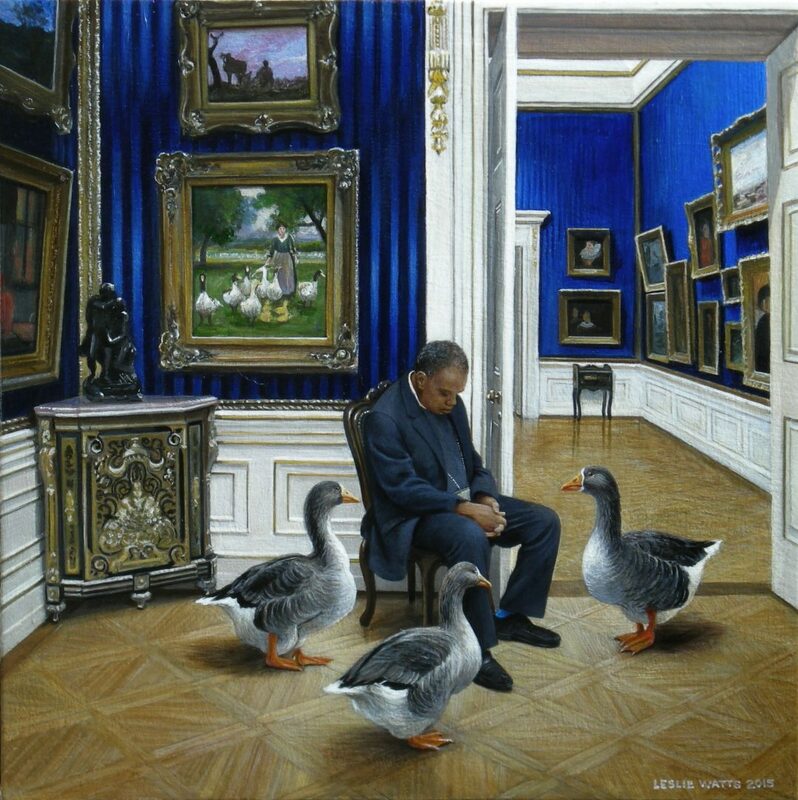 Do you think the more surreal works somehow alter how people look at the purely realistic paintings? Leslie: This question surprised me when I first read it. I’m not very well known, so I’m not sure that many people are familiar enough with my entire body of work to form an opinion about this. I had to ask some of my art students what they thought, and they all agreed that my surrealistic work doesn’t affect how they see my portraits. Usually I paint portraits to enter in competitions or as commissions for clients, and I paint the surreal pieces because I think they’re funny or compelling in some way. These are really just images where the context has been altered. I become restless if I feel that I’m repeating myself, and somewhere along the line I started imagining images where there were animals in settings where you wouldn’t usually find them. 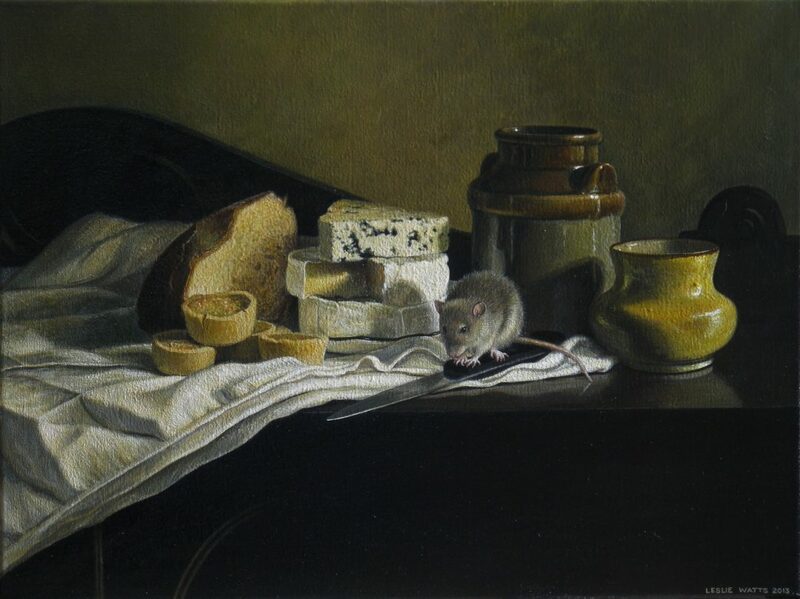 Painting in the way that I do takes a lot of time and could become boring if the subject wasn’t interesting in some way that went beyond mere light and shadow. I like to laugh, and I like to make other people laugh. I think that people are often amused by the sight of something unexpected. Usually that doesn’t happen with a portrait – at least, not the portraits that I paint. Lisa: What single work of art are you most proud of painting and why? Leslie: Every time I make a new painting, I learn something new. It’s hard to pick one that I think stands out, although my portraits from the past few years would be among my favourites. Because I also like woodworking, I’ve been experimenting with building frames that are actually part of the painting. The Bookseller is one of these. I used bird’s eye maple veneer that was reclaimed from an old piano. The pillars on the sides are railing spindles that I ripped down on a table saw. I painted it as a 60th birthday present for my partner, Peter, who owns a book shop in Toronto, and I’ve shown him sitting behind the counter in the back of his shop, surrounded by books. They are mostly titles he loves, but I also sneaked in a few secret messages, such as his children’s names and birth dates. I didn’t expect to paint all of these books in such detail, but once I started, I liked the way they looked, so I just kept going. Surprisingly, the colourful detail in the background doesn’t seem to detract from the figure, probably because he’s relatively monochromatic. 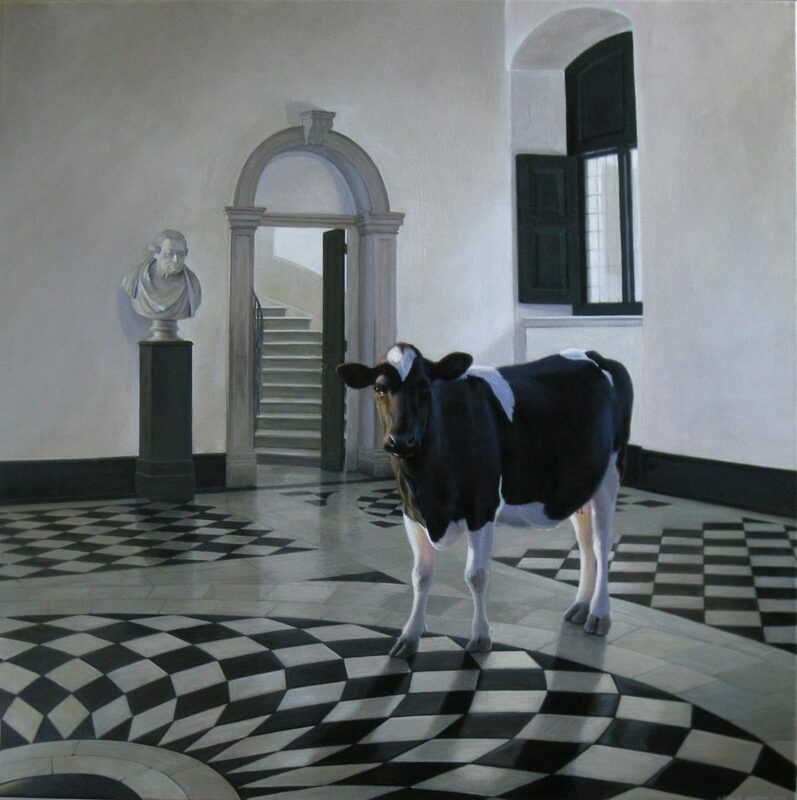 Lisa: You are known to work with egg tempera sometimes, but Dora Steps Out was painted in acrylics. Do you prefer one medium over another and what do you like most about the 2 mediums? Leslie: Egg tempera is my favourite medium, but it takes a lot of time. Acrylic is faster, and it doesn’t need to be framed, so this means that I can make paintings that are less expensive than egg tempera. I rely on the sales of my work to pay my bills, so I have to manage my time carefully and think about what the people who come to my shows will be likely to buy. My approach to the two mediums is very much the same. I start by blocking in the image with the largest brush possible, and then gradually refine with glazes and cross-hatching until the painting looks right. Each medium has its own challenges, but they are surprisingly similar. Colour shift occurs in both cases, and the relative transparency/opacity of the pigments is the same. 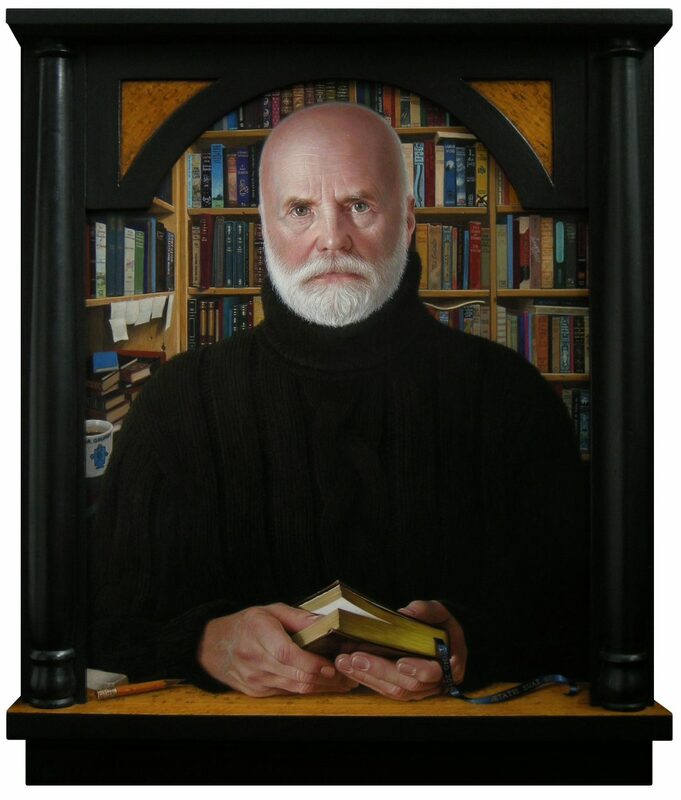 I prefer to paint portraits in egg tempera, but that’s mainly because I can achieve finer detail than with acrylic. But when I want to make larger paintings (say greater than 18 x 24″) I use acrylic. Lisa: What does a painting that has been successful look like, and how does it compare with a painting that has not been successful? Is it ever possible to revive a dead painting? Leslie: For me, a successful painting is one that I can look at and feel relaxed about. If something stands out in a bad way, I feel on edge. I’m sure that there must be a logical explanation for this, but I’d prefer just to rely on my gut instinct. Usually if there’s a problem in a painting, that’s the part that will catch my eye. Once that problem area has been fixed, it should stop drawing my attention and become part of the entire image. I have started paintings that I never finished, mainly because I ran out of time and patience, and I don’t feel particularly inclined to return to them. Usually I paint over my failures with an entirely different painting. I suppose it’s possible to revive a dead painting, but I don’t think of my paintings as living or dead. They’re either going to be finished or not, and I don’t let them out in public if they’re not finished. Because I feel a need to continue moving forward, by the time I returned to something that didn’t work a few years ago, I would likely have lost interest in the subject anyway. Lisa: Do you ever get stuck for ideas and if so how do you get unstuck? Lisa: Can you describe what a typical day in the studio is like for you? Leslie: I usually paint every day. 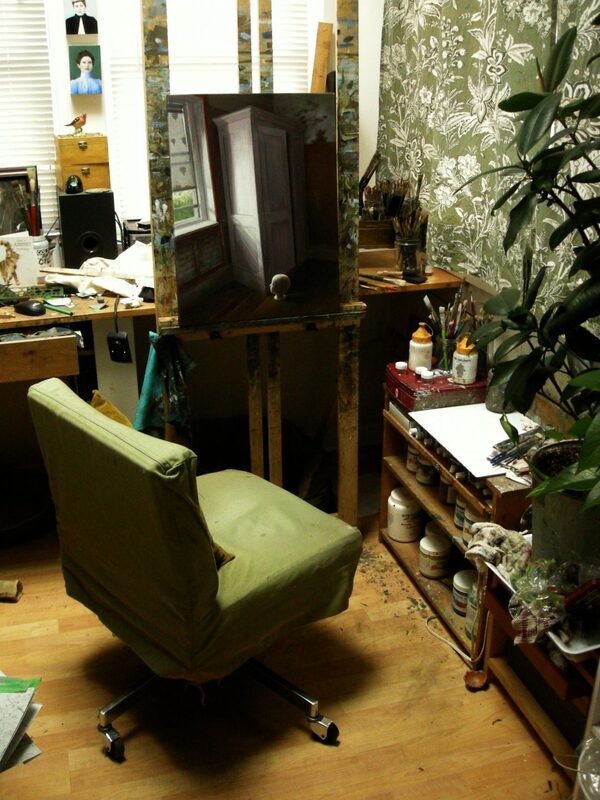 I have a small studio in my house. It’s not unusual for me to work until one or two in the morning, but I don’t have to set my alarm, so I wake up whenever I’ve had enough sleep. By the time I’ve taken the dogs out and fed them, and cleaned and fed myself, it’s usually past noon. Then I paint until it’s time for bed. I do have students who come to my house for art lessons. I teach in small groups, usually three at a time, and I have five ninety-minute lessons a week from Tuesday to Thursday. These are my breaks. I love teaching, and I find that helping my students with technical issues is a great way to hone my critiquing skills with my own work. I’m not formally trained, and I think that this actually makes me a better teacher, because I’ve made just about every mistake that can be made myself, and in most cases I’ve figured out how to fix it. A small part of my studio time is used working on my reference photos. I use my photo editing program as my sketch book. I work out the composition in advance in the photograph. When I paint, I change the emphasis by increasing or decreasing contrast, losing unnecessary details, and trying generally to make the piece look like a painting and not a photograph. This involves using directional brush strokes to define form, softening edges, and using reflected light. 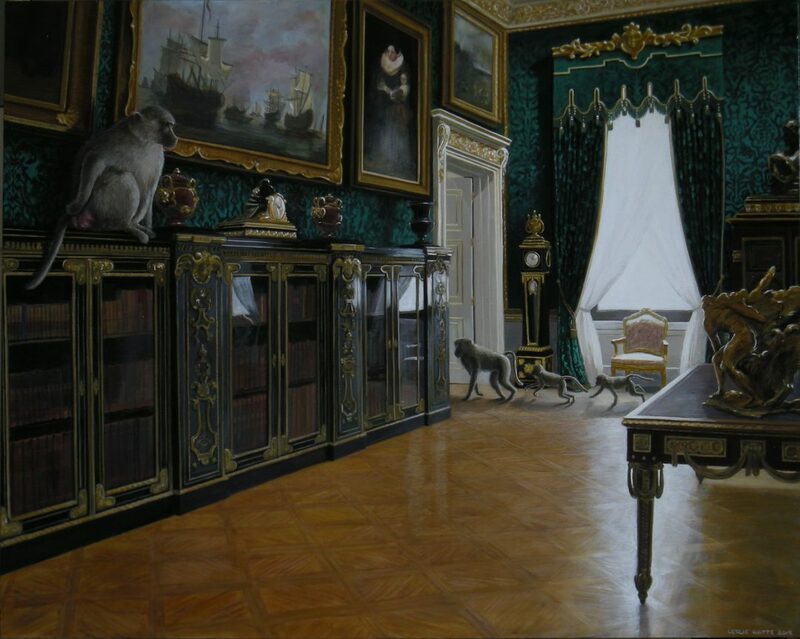 These are not elements that can be found in a photograph, so painting involves a good deal of interpretation. For me, using photos as references is a starting point, but this doesn’t mean that I’m just sitting in my studio copying. Because I spend long hours alone, I listen to audio books or have something on Netflix while I work. And I have my Twitter notifications going, so I can be in touch with my online friends. It makes a huge difference to me to be in contact with other artists on a regular basis. It’s reassuring to know that I’m not the only one who spends time like this. It’s not exactly a normal sort of occupation, and people who have nine-to-five jobs sometimes think it’s strange that I’d want to work all the time. I feel extremely fortunate to be able to do what I do. Leslie: I’m working on a series of paintings for my annual show at Village Studios, the gallery that represents me in Canada. The show is called Balloon Dreams, and it opens on June 10. The paintings are in acrylic, and they feature not only hot air balloons, but also a styrene head that my daughter brought home many years ago. I’m playing with the idea that we can’t help but anthropomorphize objects, most especially when the objects are meant to look human. 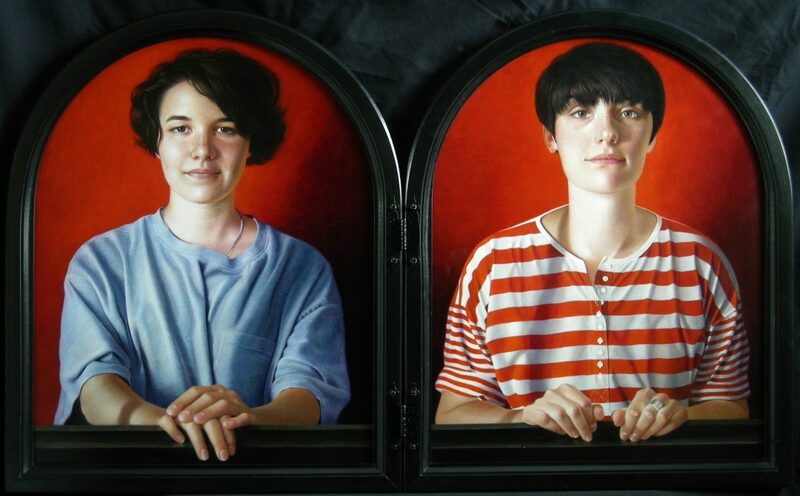 Once the work for my show is done, I’m going to paint a couple of egg tempera portraits. I also recently bought some oil paints, so I’m going to be figuring out how they work. 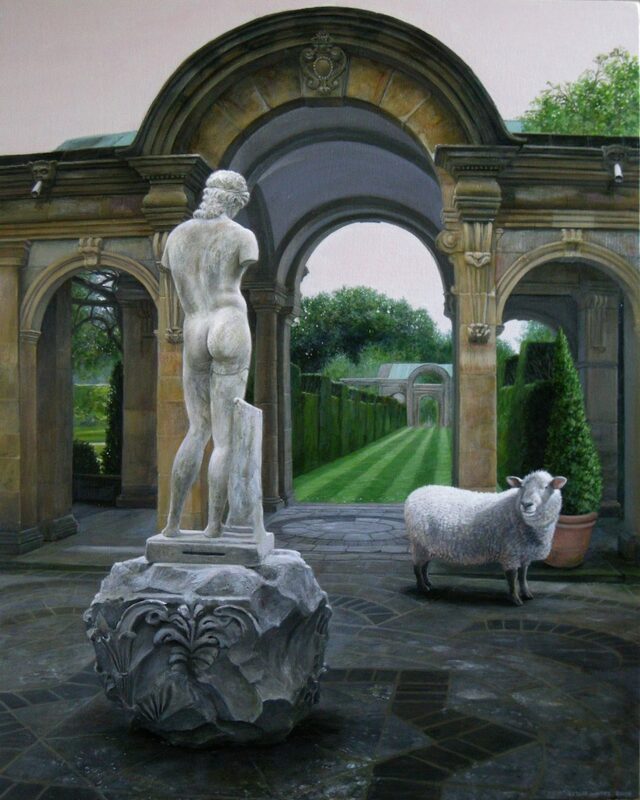 Leslie: In addition to my Village Studios show in Stratford, Ontario, I will be participating in Women in Art, a group exhibition at Burgh House, Hampstead Heath in the UK, from June 28 to July 2. Online, you can see my work at lesliewatts.ca, lesliewatts.blogspot.ca, and lesliewattsportraits.blogspot.ca.